The Workhorse combines the forged steel strength of Hamilton's HS caster series and the bolt hole pattern of the standard duty 52 series. 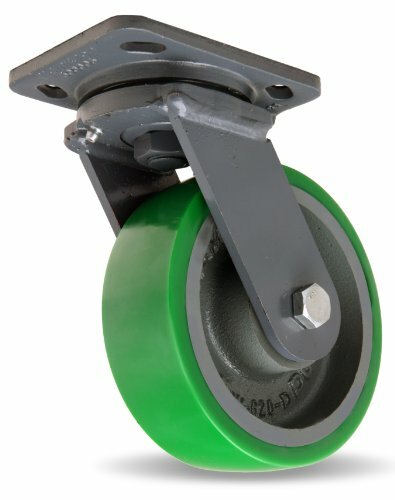 Hamilton workhorse swivel caster with 6" by 2" Duralast polyurethane (95A) on cast iron wheel with 1/2" sealed precision ball bearings. Bolt hole 1: 3" x 3". Bolt hole 2: 2-5/8" x 3-5/8". Bolt size: 0.375". Caster rig type: forged steel. Swivel caster: swivel. Caster color/finish: battleship gray. Wheel color/finish: green poly on gray center. Wheel diameter: 6". Load capacity: 1200lbs. Overall height: 7-1/2". Top plate measures 5" length by 4" width. Wheel face: 2". Wheel type: Duralast. Polyurethane material. Medium rolling ease, high relative capacity. Quiet operations, floor protection. Medium cushioning (resilience), medium impact resistance. Medium moisture resistance, high abrasion resistance. Medium relative cost, -50 degree F low temperature range. 200 Degree F High temperature range. If you have any questions about this product by Hamilton, contact us by completing and submitting the form below. If you are looking for a specif part number, please include it with your message.